The Berne Sennens home country, Switzerland, is also found three other Cattle (sæterhunde), namely Greater Swiss Mountain Dog, Appenzeller Sennen and Entlebucher Mountain Dog. However, it is not these dogs, we must talk about. Here they are only mentioned because their history partly overlaps with the Berne Sennens. Without going into details, one can say that Sennenhundene partially derived from the dogg-like dogs in that accompanied the different tribes in migration time. They were used to drive the herds of cattle forward by these people brought. Further dogs in were used to the Roman troops as they crossed the Alps and occupied Helvetien (Switzerland). The Swiss Cattle and Rottweiler are their descendants. Two other dog breeds that can be traced back to these dogs Bouvier des Flandres and Chien de Toucheur the Boef. In Central Europe developed these dogs to the so-called butcher's dog. Their task was to accompany butchers and kvæghandlernes herds of cattle and keep them on the right path. Cattle drives cattle by snapping it into hock. This technique is quite special for Cattle and is built into every Cattle. You've probably also noticed by your own dogs that they play can "drive" you and your children by snap at your heels. From Gotthard Pass led many trade routes to the various valleys in Switzerland, and it was first and foremost here, causing local varieties of these butcher dogs - large and small, short and long-haired - and they called all Cattle. For many centuries celebrity their existence only in those limited areas. Until the middle of last century, these dogs were used solely as farm and hushunde and as shepherds and Sæternes help throughout the German-speaking part of Switzerland and southern Germany. These "peasant dogs in" as they patronized was called, was really working dogs. Sennenhundene however, had no race name then. The dogs had a white ring around the neck was called "Ringgi" they with the white line between the eyes and the blaze was called "Blass" or "Blässi" (the word comes from the German word "Blass" = pale) and the dark dogs that almost lacked white, was called "bari" (a dialect term for bear). Note formindskelsesendelsen "i". Virtually all nicknames ending in "i" in the Swiss dialects. You use the suffix at everything and everyone you love. In the second half of the last century came the fashion to introduce frenmedartede dogs to Switzerland. Now the dogs have the pedigree, and was overlooked completely that hardly existed many dog ​​breeds with a story that was as long as Sennenhundenes who even had nature's own pedigree, where only the most healthy and suitable dogs could survive and continue the species. Towards the end of the last century could now only get Cattle. For Berner Sennens he found almost exclusively in Dürrbachtal (an area south of the Swiss capital of Bern). Therefore, called these dogs now Dürrbachler. Only in this area could see them. There could, however, look them in front of any milk cart (Bernese Mountain Dog and Greater Swiss Mountain Dog is excellent feature dogs) at each herd of cattle, at each farm and at each dairy and all salaš sheep farms. In this area genopdagedes Bernese Mountain now of dog enthusiast Franz Schertenlieb without, however, he could imagine the success that the breed should have in the future. 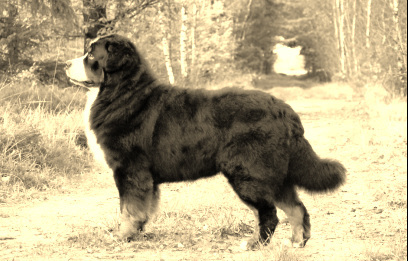 In 1908 love the Swiss cynologist Albert Heim in Dürrbachleren, and he gave later the name Bernese Mountain Dog. Bernese Mountain, which were mainly farmer working dog fit with its harmonious colors well with nature. But this was obviously not enough. It could only be used if its character corresponded to the tasks and duties it had. Following contemporary concepts was a dog only "good" if it were watchful, sharp but not snappy. When you left the house, it should follow the operator at every step, drove one carriage, it should run between the rear trailer wheels. It had never run out in the fields. If necessary, should its master defended. Objects that were terminated in the meadow (food baskets, tools, etc.) should be guarded. Under no circumstances should the chasing game. Cats and chickens were left alone and almost the most important, it may not at all roam. It was no small thing, they demanded of a good dog, but all this did Bernese Mountain. We, who owns a Bernese Mountain in that it has several advantages. Because of its quiet and friendly nature it is an ideal family dog ​​with a love for children that sometimes borders on the incredible. When fully grown, its movement urge not very large. It would however, take walks, also very long trips, but it need not. Sennenhundenes loyalty is legendary and surpassed hardly. I will end this small retrospective with an excerpt of a description, which was written by Professor Albert Heim: "All Cattle is no guile, comfortable and good house and family dogs that hardly surpassed by other races. Devotion, loyalty, awareness and understanding distinguishes them. A Bernese Mountain seems to me to be the prettiest dog that exists at all. " I think that no one really knows Bernese Mountain will contradict Albert Heim. Switzerland. Club for Bernese Mountain Dogs: The Bernese Mountain Dog. Jubilæumsskrift.